The spring issue of the award-winning Atlantic Salmon Journal features stories of salmon anglers and conservationists from all walks of life, at all stages in life. 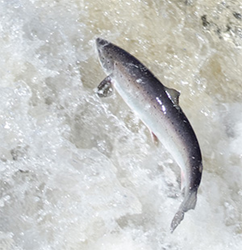 A leaping wild Atlantic salmon. The rod is a promise for the future, and it's being made not only to Georgia, but to the next generation of anglers to come. The Atlantic Salmon Journal’s spring issue features the story of Pastor Robert Bryan, a clergyman, who in addition to his day-to-day job of pastor for the isolated communities on Quebec's North Shore and Labrador was an unsung hero who often acted as an air ambulance driver and flew many people to safety. Bryan has become a living legend as a leading Atlantic salmon conservationist and the creator of an important force for good, the Quebec-Labrador Foundation. Along with the 83-year-old’s tales of heroics, is an article on fly-tying written by a ten-year-old boy, who has met more master fly tiers than experienced tiers four or five times his age. This latest issue also features the story of 10-year old Georgia, a young angler who is learning the sport of fly-fishing on an old-school bamboo rod, custom made by her father. “The rod is a promise for the future, and it’s being made not only to Georgia, but to the next generation of anglers to come,” says Livia Goodbrand, writer of Georgia’s Promise. The award-winning Journal, published quarterly since 1952 by the Atlantic Salmon Federation (ASF), is the world's premier publication for the conservation-minded salmon angler. The magazine strives to show that Atlantic salmon angling and conservation is an activity anyone and everyone can become involved with. The spring issue of the Atlantic Salmon Journal, a publication of the Atlantic Salmon Federation, is available now on selected newsstands in Eastern Canada, Quebec and the northeastern United States. Subscription to the Atlantic Salmon Journal is included with a membership to the Atlantic Salmon Federation. Inquiries for membership may be directed to: membership(at)asf(dot)ca.